South Dakota has, according to the USHCN site twenty-five stations, ranging from Aberdeen to Wood. 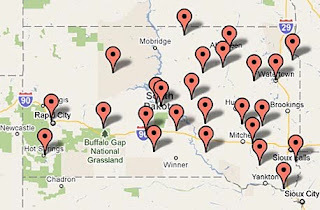 They seem a little more evenly distributed than the set in North Dakota but not a whole lot of information from the North-west of the state. 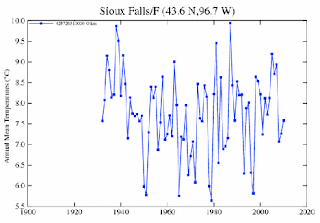 However, when we look at Sioux Falls, GISS are back to using a station with a truncated series, in this case existing only from 1932 – sigh! 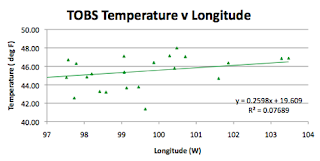 Well I will first load the station temperatures into the spreadsheet, and then we’ll see what I find. 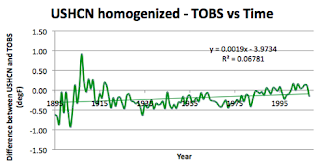 The average GISS station temp is 0.39 degrees F higher than the average USHCN with homogenized data. Average raw temperature record (TOBS corrected) for South Dakota. 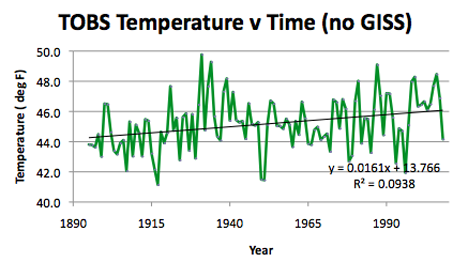 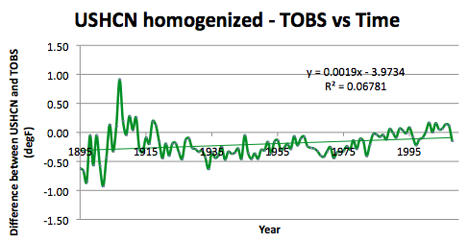 The difference between the 1.6 deg per century of the TOBS data, and the 1.8 degrees of the homogenized data is not shown here. Turning to the population and geographical information for the state. 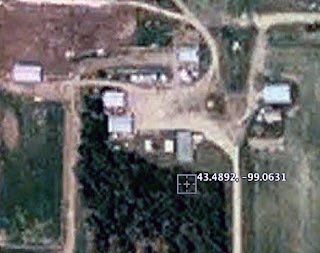 Academy appears to be a state farm. 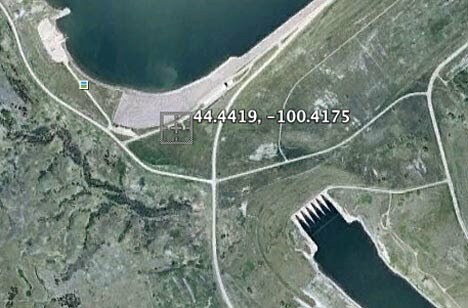 Shall we say a population of 20? 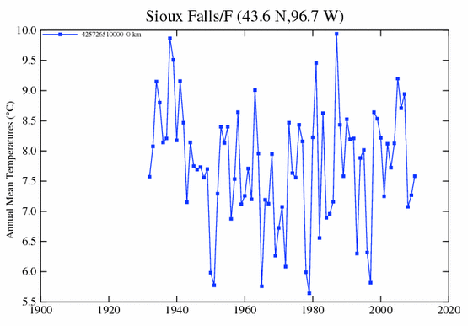 It almost goes without a need to mention it that the GISS station at Sioux Falls is in the largest population of the stations recorded. 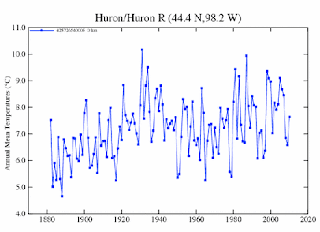 Looking at the state geography in general, the state is 380 miles long by 210 miles wide, running from sensibly 98.5 degrees W to 104 degrees W, and from 42.5 degrees N to 46 degrees N. The average elevation is 670.5 m above sea level, with the average USHCN station being at 554 m, and the average GISS station being at 416 m, so being significantly below the mean. 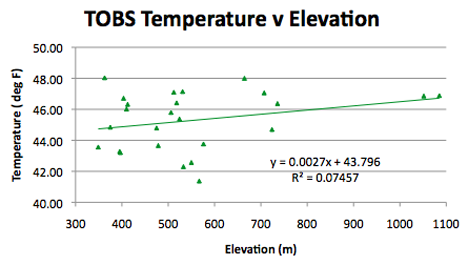 The stations are therefore all well below the mean elevation, only 5 being above it. 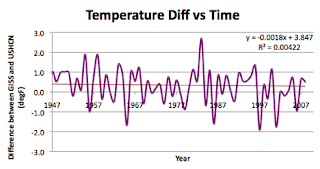 So what does the temperature data look like? There is a stronger correlation here than with a number of other states. In regard to the longitude, again I believe that this is related to elevation change. 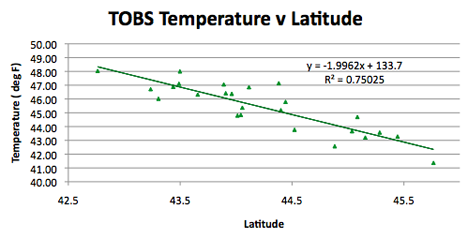 South Dakota temperature as a function of longitude. 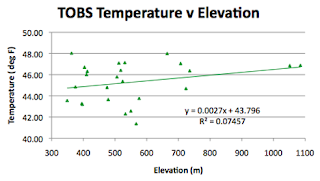 However the correlation with elevation is not that high in this state, and in fact goes counter to prediction actually rising with height. However when it is considered that the two highest points are a) in Rapid City, which is one of the larger conurbations in the state and b) the other is at Hot Springs, perhaps the local geography is exerting an overall influence beyond the norm. 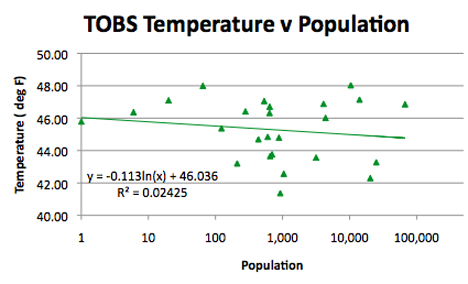 And for this state there is no correlation with population size, at least to an initial impression. 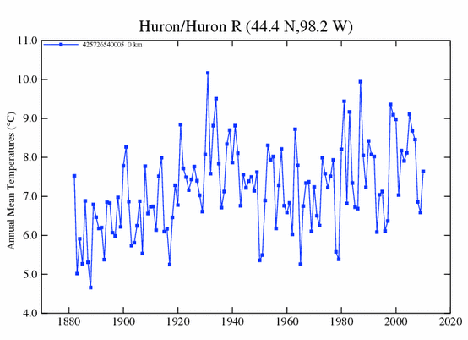 While we end, as usual with the difference between the raw and homogenized data for the USHCN. 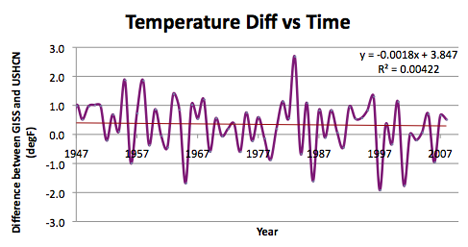 There does seem to be some trend to the adjustment after 1970.